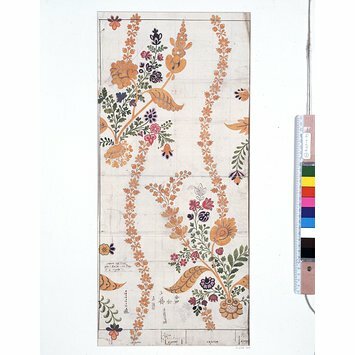 This design is one from a group of designs known as the 'Liddiard Set', which was given to the V&A by Mr G.W. Sherriff of Streatham in 1862. According to Luther Hooper, who compiled the first typescript catalogue of Spitalfields textiles designs in the Museum, on the cover of the folio (now missing) which contained this Set, was inscribed 'Pattern book of Liddiard & Co. Circa 1718'. In addition, most of the designs in this Set are inscribed in ink with 'L & Co.', as well as a number. The designs are also numbered heavily in pencil with a different number and have also all been numbered subsequently by the V&A - E.4440 to 4519-1909. 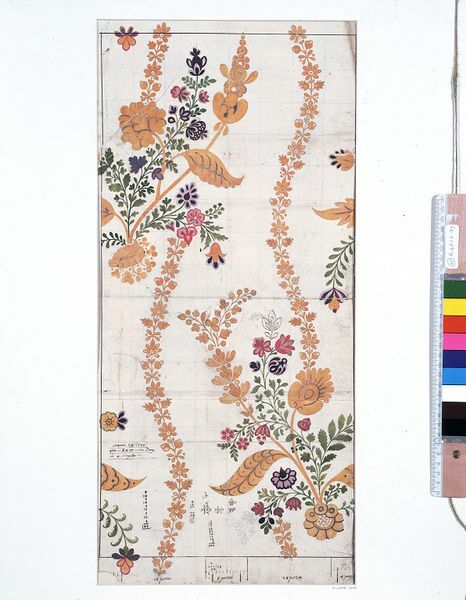 Natalie Rothstein researched and catalogued the designs for her publication Silk Designs of the Eighteenth Century. In it she states that 'the drawings in the Liddiard Set range in date from 1717 to 1722. They are mostly numbered heavily in pencil in the same way as the drawings in the Vanners Silks Set, which were all drawn by Leman between 1706 and 1716.' The Vanners Set is now known as the Leman Album (after the designer, James Leman), which is also in the V&A Collection - E.1861.1 to 106-1991.